Got Milk? 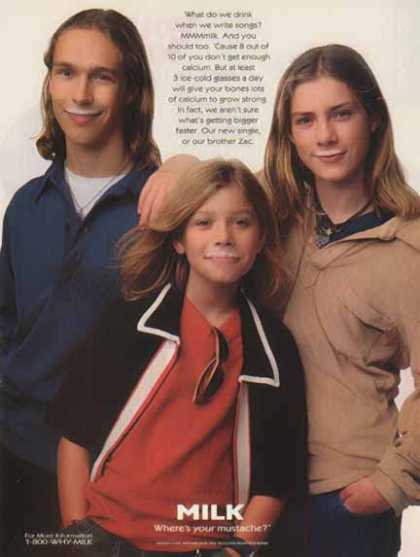 Celebrities looking silly in 90s posters advertising milk. Back in the mid 90s it seemed the American public were drinking too much coffee, soft drinks and other stuff and not enough milk. Well not as much milk as the dairy farmers of America would have liked and sales were really falling. 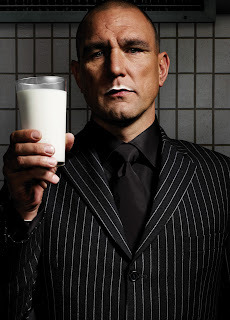 So The National Milk Processor Board decided to hire some advertising people to launch an ad campaign. 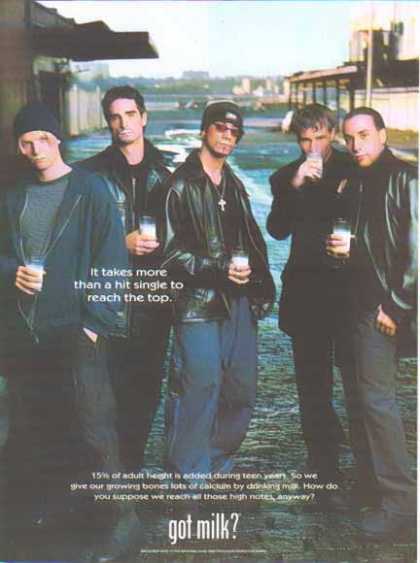 So an advertising campaign entitled 'Got Milk' ran, featuring posters of celebrities and even fictional characters from television and film and appeared in magazines across the USA. 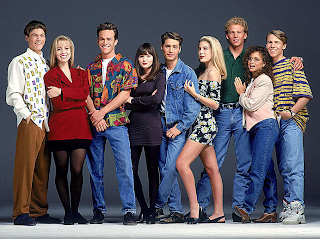 Actually, it's still going strong today so not just a 90s thing. Being from the UK I don't remember this at all as we never get to see them over here! 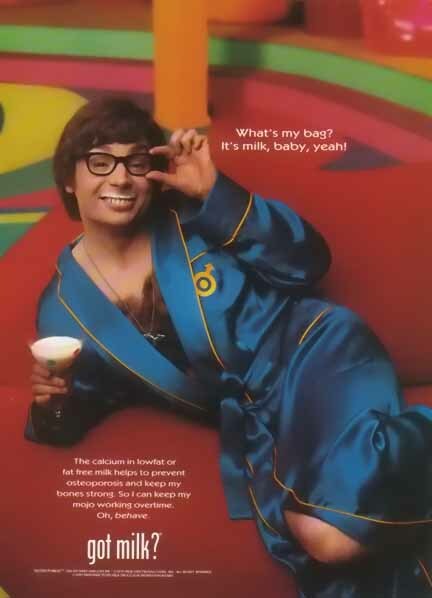 (1999) It's Austin Powers advertising milk. Groovy. 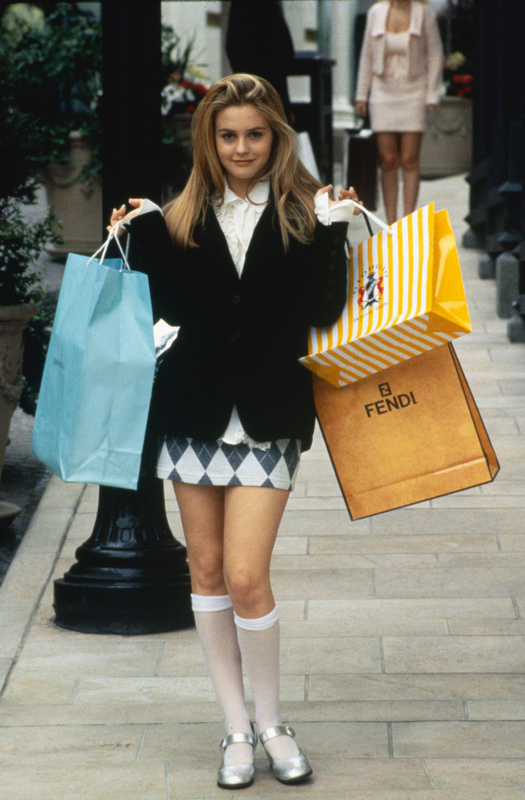 (1999) Aww, this is when Britney looked all sweet and innocent. Long time ago. (1996) It's Jack from Lost! 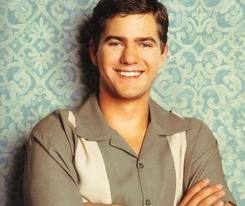 Only years ago when he was on this programme called Party of Five. 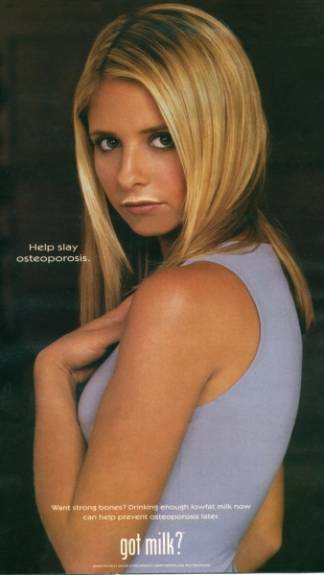 (1998) It's Buffy doing her bit to 'help slay ostereporosis'. 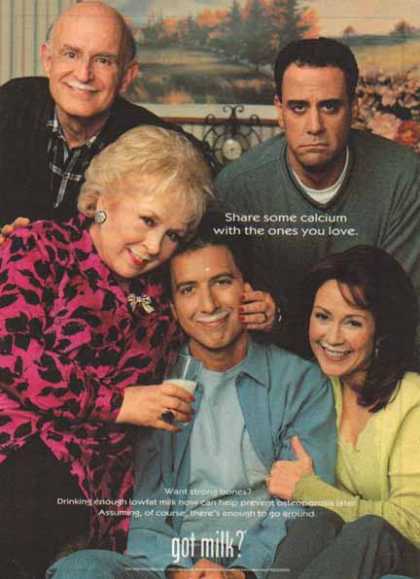 (1999) Oh look, Everybody Hates Loves Raymond and his annoying lovely family advertising milk. (1995) Phoebe and Rachel from Friends. One question- where's Monica? Text reads- 'We're such good friends, if I got invited to a big Hollywood party, I'd call you the minute I got home. Or if you had stuff on your face, I'd tell you, sooner or later. 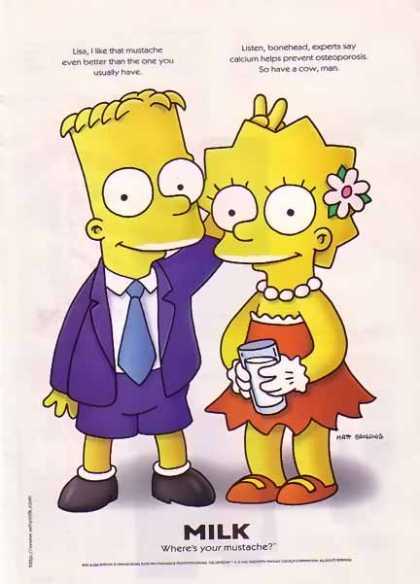 (1997) Even The Simpsons got asked to do an ad. 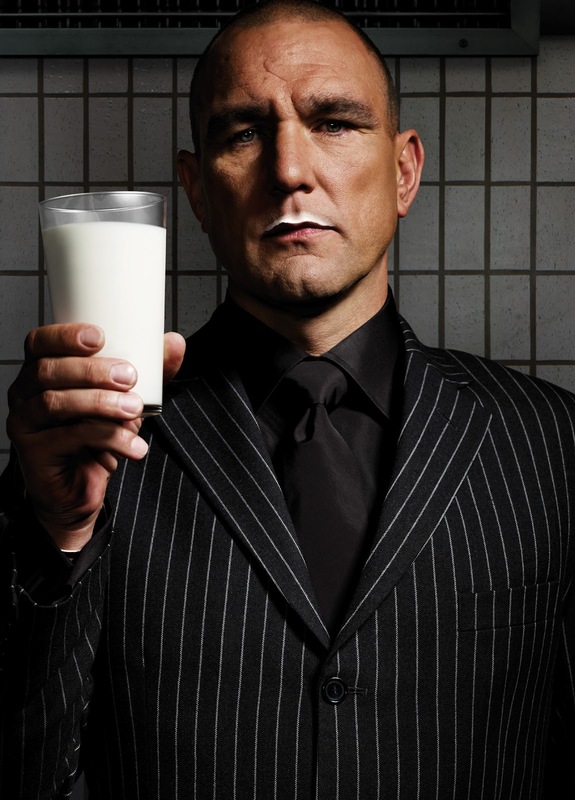 I've just discovered the UK started doing similar ads for their 'Make Mine Milk' campaign a couple of years ago. (!!!) Seeing that milk is actually healthy this is one of those celebrity endorsements that is probably a good thing. So I say, keep going for both campaigns. We want to see more! If you were alive in the late 90s, over the age of five and not living under a rock it's impossible that you won't remember BN biscuits. Aside from the fact that they were really quite tasty, the UK adverts with their o-so-memorable jingle, 'BN BN, do doo do do do. 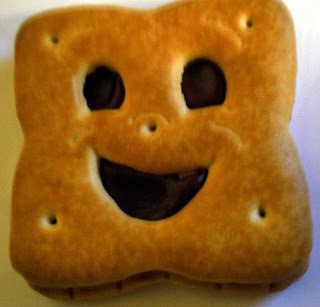 BN BN, do do do do...' was enough to etch BN biscuits into your brain, never to be forgotten. For what seemed like ages but was actually a limited time in the late 90s and early 00s, BN biscuits which are originally from France were hot stuff. It seemed their playful smiley face revealing the rich chocolate filling sandwiched between the two biscuit layers was a winning combination. They were cleverly marketed at kids with the smiley face and catchy theme tune and all, which was no doubt recited around the nations playgrounds at lunchtime (don't you just love it when greedy marketers con kids into eating junk food), not to mention adults alike who probably recited the theme tune in offices around the nation. All this made people remember to pick some up from the supermarket and put them in theirs and their kids lunchboxes for the next day. Result. The good thing about them is that they did actually taste really nice, so we'll forgive them all the hype. Whilst I loved them at the time, I'll be honest, they hadn't crossed my mind until recently. Then to my great disappointment I found out they're no longer stocked in the UK. That's right, NOWHERE in the UK. They haven't been since sometime in the early 00s when they disappeared COMPLETELY. And it's a bit of a mystery why. There's a couple of theories, one being the interesting although strange urban legend claiming they were banned because one batch of biscuits contained cocaine. (Ha, don't you just love stupid urban legends?) A more likely theory is that they probably just didn't sell enough. This seems odd considering how popular they were though, so I guess the discontinuation of the BN biscuit will have to go down as one of the mysteries of the universe. The good news is they're still sold in some parts of Europe, particularly in their homeland France where they're super popular. They can also be bought over the internet and shipped over. So if you're desperate there are ways. Expensive ways, but still ways. I'll leave you with a clip from The Office (that amazing early 00s TV show featuring Ricky Gervais), in which Gareth, David Brent and some other bloke sing 'Mah Na Mah Na', the original song inspiration for the BN biscuit advert theme. It's good. To find out what happened to another 90s snack time classic check out my Sunny Delight post. Before he was getting his heart broken in 500 Days of Summer or fighting evil in the next Batman film (I don't actually know if that's what he does, but you get the idea), or even being an alien in 3rd Rock From the Sun, Joseph Gordon Levitt was a cute little kid and adverting pop tarts. Kristen Stewart rides a Porsche to school. That girl gets all the fun. This is an 80s advert but it's way too funny not to include. 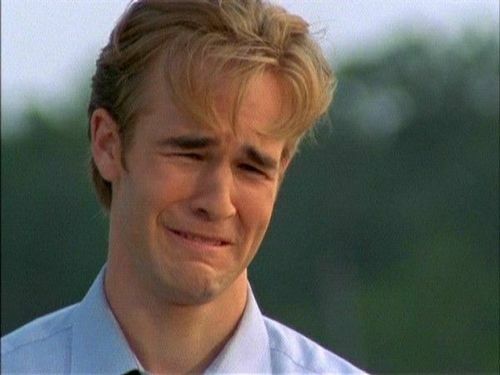 Check out Keanu's never failing top notch acting. One of Anne's first television performances at the age of fourteen or fifteen. Wow, she doesn't seem to have had an awkward early teen stage and looks as beautiful and fresh faced as ever. This reminds me of Tom Cruise in Risky Business. Top marks go to Ben Affleck for doing his best impression of a sleazy teenager. Mila Kunis was sooo pretty even then. Doll's pretty creepy though. This is from 1989, but I don't care. It also wins as best 90s advert (not that there was a particular order anyway), even though it's not from the 90s. This is simply because it has Brad Pitt in. 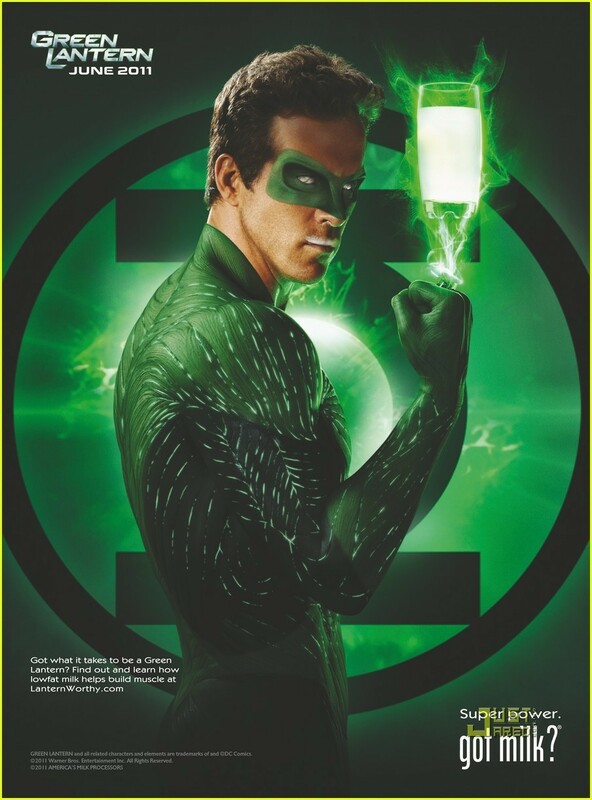 And he looks good. Very good. He's also the best actor in it, but that goes without saying because we all know how great he is. 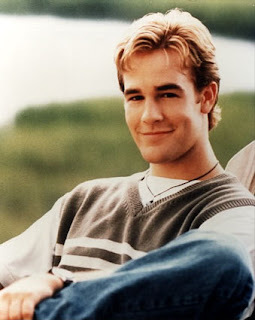 It's some time at the end of the 90s. You get home from school on a Friday afternoon, dump your rucksack in the hallway, get super excited when you remember there's double Simpsons on tonight then dash to the fridge where there's this week's new bottle of Sunny Delight waiting for you. There was even two different flavours: Florida style and California style. Turned out it was too good to be true. WAAAY too good. For starters (and this is NOTHING compared to what's next), it somehow came out that this 'healthy' beverage was actually only 5% juice. Yes, 5%. Which obviously meant that the other 95% was food colouring, sugar and a load of other extremely unhealthy rubbish. In fact, one glass of Sunny Delight had the same amount of sugar as a can of Coke. No wonder it tasted so good. 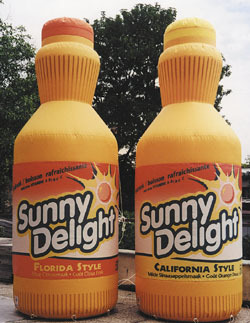 This really wasn't Sunny Delight's year. You see, around the same time as these revelations were coming out, some poor, poor four year old girl in Wales was very publicly admitted to hospital following being turned a 'yellow colour' by consuming too much Sunny Delight. Seriously. Apparently the kid had been drinking 1.5 litres a day of the stuff which is about seven and a half glasses. Perhaps her parents had a tap which poured Sunny Delight instead of water? Wasn't this kind of lifestyle expensive? Anyway, the yellow colouring she turned was all due to all the beta carotene in the drink. 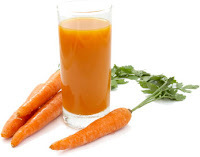 Beta carotene is a pro vitamin A which is found in low doses in vegetables such as carrots and produces their orange colour. Every glass of Sunny Delight contained 120 micrograms of beta carotene which is around 30% of the recommended daily intake for an adult. However, since the girl was drinking seven and a half glasses a day, she would have been consuming over twice as much of the recommended daily intake for an adult, never mind for a child. And this excessive consumption of beta carotene can lead to yellowing of the skin. So this meant, shock horror, it could happen to you too. A spokesperson for Procter and Gamble (Sunny Delight's owners) obviously desperate for the company to save face reassured everyone that the colour change wasn't really anything to do with Sunny Delight, as it could also happen if a person ate too much carrot juice and was only temporary anyway, as a person's colour would go back to normal in a couple of weeks. Clearly they were clutching at straws here. Looks healthy enough to me. You'd think all this was bad enough, but then just to top it all off the new Sunny Delight advert came out, a Christmas themed one featuring two snowmen who turned a yellowy orange colour. Talk about badly timed. None of this worked and Procter and Gamble completely gave up on the product in 2003 and sold it on. It was then relaunched and remarketed as Sunny D. The product has in fact had quite a few relaunches over the years with the marketers trying out new adverts, slogans and even changing the ingredients. At one point they even changed the juice content to 70% (so it was actually healthy this time, not just fake healthy). However profits could never reach anywhere near what they once did. 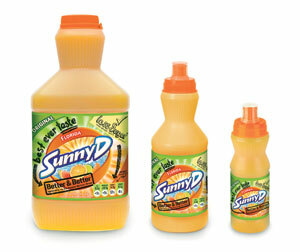 Sunny Delight during its 'Sunny D' phase. It's very cheap, costing about £1.30 for a whole litre and appears to be targeted at families. It's 15% juice, which is a slight improvement on the 5% from years ago. Sadly, it doesn't smell like it once did. Do you remember that amazing sugary orangery smell? OK, credit where credit's due, it does smell like that but only a teeny, tiny fraction of what it used too. And as far as taste goes, it doesn't have that Sunny Delight magic any more. It just tastes like a run of the mill orange soft drink. So not bad I suppose, just not the Sunny Delight I remember. Check out my other post Whatever happened to BN biscuits?